I really wish I had money. I always think that, if I had lots of money at my complete disposal, I’d know exactly what to do with it. But this is only a half-truth. I really have no idea what I’d do with a bunch of money. I certainly wouldn’t spend it on stupid people, that’s for sure. I’ve never come into a large sum of money, but I know plenty of people–even so-called “friends” who would suddenly become a lot friendlier if they knew I was wealthy. Those leeches would go straight to what gets me most: baking and Real Housewives. I know them too well. Sometimes I wonder if I would turn really snobby if I were rich. You know those people. They tote teacup sized dogs in large designer purses, wear huge sunglasses in an attempt to pretend they’re famous, and have lots of crystals on the asses of their jeans. They also drink fine wine, have fresh flowers delivered to their immaculately designed homes and get mani-pedis twice a week. And shop at Whole Foods. Man, I love Whole Foods, but sometimes I’m like wtf am I doing here, I am poor. Okay, maybe I wouldn’t be that snobby. But in their defense, chaises are really cool. And I’m positive many un-snobby people have them–but really, WHAT do you use them for? Certainly not lounging. The only thing I’m particularly snobby about is grammar. I’m an English major, but even without that title, I simply do not understand why people cannot spell. Or use proper grammar. Should we go back to grade school when we’re taught our “your” and “you’re”‘s? Because seriously, insulting someone or speaking with a “your” when you mean “you’re” is pathetic. Or when people misuse their “they’re,” “their,” and “there.” THEY’RE idiots because THEIR brains cannot comprehend that THERE means distance; THEIR means possession; and THEY’RE means ‘they are’. See? It really required a lot of energy and brain power to understand. Phew, I’m ready for a glass of aged wine and some cheese. Where’s that grape-feeding maid when I need her? But seriously, if I had oodles of money, I’d like to think I’d spend it wisely. And by ‘wisely’ I mean vacationing in Europe three times a year, shopping to my heart’s never-ending content three times a week and investing it wisely to earn me even more money. And I suppose I’d donate some to charity so people wouldn’t get all huffy that I’m some snobby beeyatch with a chaise lounge. No one likes to be bothered with furniture matters. Anyways, the idea of these brownies sounds quite luxurious, if I do say so myself. One, because typically, fresh raspberries cost an arm and a leg. Lately, however, they’ve been decently priced in my area, causing me to stock up whenever possible. Two, because any time you pair fruit and chocolate, people get all antsy that something fancy is going down. And three, because even if you have a skinny pocketbook like I do, we all deserve to feel sophisticated and snobby and rich, even if we don’t have crystal asses or even know what the hell ‘shiraz’ is. 1. Preheat oven to 350 degrees F. Lightly grease an 8×8 or a 13×9 inch baking pan (your choice if you want thicker or thinner brownies–I did mine in a 13×9). In a large bowl, prepare brownie batter according to package directions. 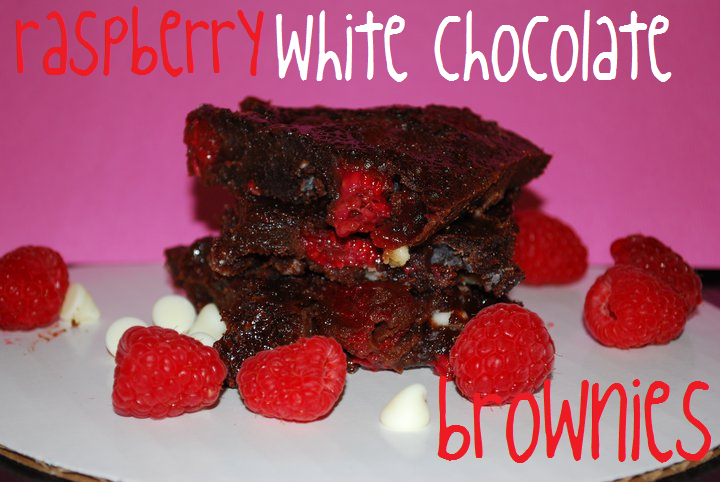 Stir in rinsed (if fresh) raspberries and white chocolate chips; gently combine into batter. 2. Pour batter into prepared baking pan and bake according to package directions based on which pan size you chose. Brownies are done with a toothpick inserted in the center comes out mostly clean or with no crumbs. Cool completely, then cut into squares and store covered in fridge. Look at you, fancypants! Noshing on some fancy brownies in your foyer… or on your couch, whatever.